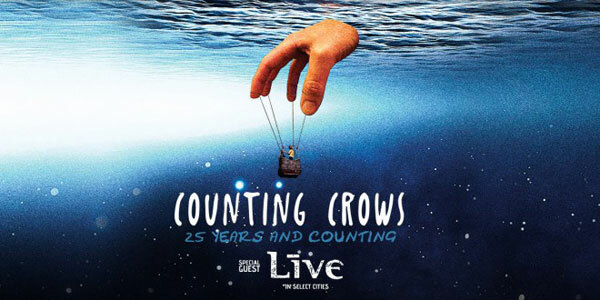 Home » Alternative Rock » Concert Review: Counting Crows And Live At BB&T Pavilion Camden, NJ! Concert Review: Counting Crows And Live At BB&T Pavilion Camden, NJ! Talk about one of the best touring packages of the summer! The 90’s nostalgia was in full force when we caught the recent performance from both The Counting Crows and Live at the B&BT Pavilion in Camden, NJ! It is hard to even fathom that The Counting Crows are celebrating a 25 year anniversary because as we watched them, along with their tour mates Live, perform it truly felt as if no time had gone by at all. Each and every time we have had the pleasure of catching The Counting Crows in concert, it has been a real treat, as you can never quite tell what kind of show you are going to get, as front man Adam Duritz loves to keep things unpredictable and no two shows are ever exactly the same. This tour was appropriately titled “The 25 and Counting Tour”, because you can truly feel that The Counting Crows have a true passion for the music that they have created and still continue to create and certainly do not plan of fading out to pasture anytime soon. We adored the fact that Duritz shares certain personal stories and anecdotes that accompany majority of the songs played, as it allows us to take a peek inside the song and perhaps walk away with a completely different understanding and appreciation for some of our favorites including “Omaha”, “Long December”, “Round Here”, “Miami” and “Colorblind” to only name a few from their amazing set list for the night. With such an extensive catalog of music, we can’t even imagine how hard it must be to decide which songs make the cut and on a side note, so happy “Hard Candy” was tossed in the set on this particular night! Duritz was incredibly gracious and humble when speaking to the crowd of die-hard fans about the band’s longevity, saying that the band had always hoped someone would pay attention to their music and are very thankful that the fans latched on and still continue to support the band to this day. So much passion and emotion erupts from the stage when watching the Counting Crows perform live and it is a truly like attending a music therapy session rather than a concert. The band changes up some of the chord structures and other elements to the songs giving them a fresh breath of life and seeing this band in the live element is certainly worth it, as the songs take on a new life that is completely different than just listening to the album versions. The Counting Crows are one of the most diverse and expressive live bands out there and definitely worth checking out in concert! The Counting Crows were joined on the “25 Years And Counting Tour” by Live, who absolutely blow us away with their live performances. We were fortunate enough to catch the band’s first live performance with original founding member and lead vocalist Ed Kowalczyk at Rock On The Range 2017, after he returned from a lengthy hiatus from the band and we once again fell in love with the music and absolutely couldn’t wait for the opportunity to catch them again. We couldn’t think of two better bands to be joining together on the road than Live and The Counting Crows once again filling us with the feeling of 90’s nostalgia that we so sorely miss! Live knows how to put on a fantastic show and we found ourselves belting out the lyrics, along with the rest of the massive crowd who were in attendance, to our favorite songs such as “Pain Lies On The Riverside”, “Selling The Drama” and our personal favorite “Lakini’s Juice”. The band also treated us to a wonderful cover of the Jimmy Reed song “Baby What You Want Me To Do” proving that Live certainly cannot be boxed into one particular genre and truly showcased the band’s stellar musicianship and Kowalczyk’s incredible vocal range. Kowalczyk spent a good amount of time during their set interacting with the audience and this was especially heart-warming because the Camden, NJ/Philadelphia tour stop is like a hometown show for the band, whose roots are from York, Pennsylvania, just a short distance away. Kowalczyk reminded the crowd about how music can be an escape from the everyday trials and tribulations of life and let loose for awhile. He urged the crowd to let go of their phones and gadgets for a bit and just enjoy and feel the music and much to our surprise everyone seemed to listen. It was amazing not to have to watch the show through the back of someone’s cell phone screen for a bit and gave us the opportunity to truly feel and enjoy the music that was pouring forth from the stage. It was wonderful to once again see Live back together again and they sounded just as fantastic as they did in their younger years. It was great to see the camaraderie between the members of the band especially Kowalczyk and guitarist Chad Taylor as they tore through the band’s impressive musical catalog and delighted us with their newest track “Love Lounge” proving that like The Counting Crows, Live has no plans to hang it up anytime soon! We can’t praise these two band’s enough for an evening full of amazing tunes, insightful stories, and a heck, of a lot of fun! Here’s to 25 more, guys! Keep rocking!